how are you doing with the new roman missal? 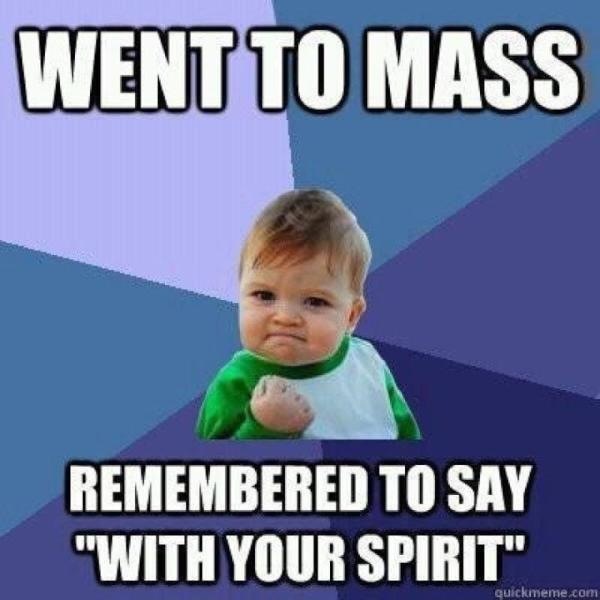 The above picture was posted on Facebook shortly after the New Roman Missal was introduced. It still makes me smile, and elicits a chuckle from all who see it. (I apologize for not giving credit to the original artist.) Hubby and I mimicked the hand-pumping seriousness of this little guy when we remembered the right response. Being a quick study, hubby’s track record was much better than mine. I’m still blurting out the occasional and also with you. I still can’t wrap my mind and tongue around the Lord, I am not worthy. I’m sorry, but under my roof just sounds strange and clunky. And chalice instead of cup during the consecration prayer is still distracting; images of the holy-grail dance in my head. I’ve read many books on the art of writing. The most valuable rule that I have learned is this. Keep your sentences simple. Do not use five words if you can say the same thing with two. Cut, cut, and cut some more! Sentences like the one above are crying out for an editor’s red marker. The New Roman Missal has been with us for four months now. I am still not comfortable with it. I doubt that I ever will be. I’m still angered by the way it was imposed on us. The pamphlets and music sheets in the pews remind me of the financial burden it placed on parishes. I miss the well-loved mass arrangements that are suddenly banned. I feel sad about the whole mess. But that is me. And, I do tend to hold grudges. How are you and your parish doing with the New Roman Missal? Has it become a welcome addition to your liturgy or a source of discomfort? Is the newness slowly dissipating with practice? Do you love it, hate it, or just not think about it? I’d love to hear from you.